How do I get hold of Sudoku Xtra compendiums or books? You can either choose to download and print it yourself or you can buy a pre-printed copy. The download version is supplied as a PDF, which can be printed via the free Acrobat Reader or many other pieces of software. Is Sudoku Xtra a magazine or a book? It's a book, but because it consists of a series of volumes, and it originally replaced the previous store magazine 'Sudoku Pro', I've historically referred to it as a magazine. But now that most people read it via pre-printed copies available from Amazon, where it is available perfect bound as a (large!) book, it makes more sense for me to refer to it unambiguously as a book. Also it can only be listed on non-US Amazon stores if it is classified as a book and not a magazine. Who is Sudoku Xtra suitable for? Anyone who enjoys puzzles should enjoy Sudoku Xtra! The puzzles are language-independent so if you can follow the English-language instructions (or get them translated) then you will be able to solve the puzzles. There are puzzles to cater to all levels of interest, from casual solver to puzzle fanatic! The vast majority of the puzzles are relatively challenging, but none of them require guess work to solve and they can all be solved by reasonable logical deduction. All of the puzzles in the main section of each volume and all of the puzzles in the books are made by me, Dr Gareth Moore. They are either entirely hand-made or have a significant manual component in their creation. I am the author of a wide range of brain-training and puzzle books for both adults and children as well as many magazines and online puzzle sites. Issues from 2 to 23 inclusive also included contributed puzzles from the cream of the crop of the world's puzzle creators. I stopped doing this with issue 24 as I completed a shift to focus more on the core sudoku variants which have certainly proved the most popular parts of Sudoku Xtra. What are the pre-printed versions like? If you buy a printed copy from Amazon then you'll get a large 8.5 inch by 11 inch (for issues 19 and later) or 8 inch by 10 inch (for earlier issues) perfect-bound book with a full colour glossy cover, printed on quality paper perfect for solving puzzles on. These are now available from all European Amazon stores, including Amazon.co.uk, as well as Amazon.com and Amazon.ca. These books far exceed store magazine quality - and in fact exceeding the quality of most other puzzle books too. Amazon also typically offer either free postage and packaging, sometimes without condition or otherwise if your order reaches sufficient value. What happens if I choose the download? After you pay you'll immediately receive a link via email to the full PDF of the content which you can print out yourself. It's designed to print perfectly on either A4 or Letter sized paper, and you need print only the pages you want - each puzzle page has full instructions on, so there's no need to print every page immediately if you want to save paper or ink. Almost all puzzles are also still playable if printed 2-up, with two pages per side of paper. You can print each page as many times as you want for your own private use, so this is a great option if you like to start again on puzzles! Can I print it with a black and white printer? Yes! 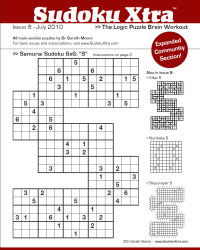 Sudoku Xtra magazines and books are designed to be printed in black and white, and although each issue of the download version has a different colour theme for the headings this forms no part of the puzzles and is purely decorative - it will print as grey on a black and white printer. Not any more. I used to offer this option but once I began to publish Sudoku Xtra less regularly it stopped being so appropriate so as of issue 24 I have discontinued it. Existing subscribers will continue to receive their pre-paid issues as expected.